We all know the U.N., Red Cross, CARE, UNICEF, Doctors without Borders, Habitat for Humanity, Mercy Corps -- but what about smaller, private initiatives of the international community in Haiti? Individually, their efforts are tremendous. Collectively, they are of staggering importance. In the fields of agriculture, the arts, children and orphans, education, health, housing, microfinance, and reforestation, private initiatives are in the trenches helping to build the new Haiti. Workers for Yéle Corps are employed four weeks at a time, with a long waiting list for jobs as they come vacant. The majority of workers come from tent camps, and in most cases the income they receive supports an extended family. Photo: Yéle Haiti / Sebastian Petion. Recently, at the suggestion of Congressman Ben Gilman, I coordinated the leadership of select private initiative efforts in Haiti to meet, hosted by Bob Cushman of Morgan Stanley Smith Barney. Sixteen global citizens participated, with another six requesting updates. The informative and inspiring meeting has led to the planning of a press conference to keep the spotlight on HOPE for Haiti -- not the continuing hell and horror of debris, disease, and destruction. Noting donor fatigue at the endless cycle of bad news, the group will focus on what positive accomplishments and possibilities exist..
(Deschapelles) 2. International University Center Haiti (2011, Léogâne) 3. 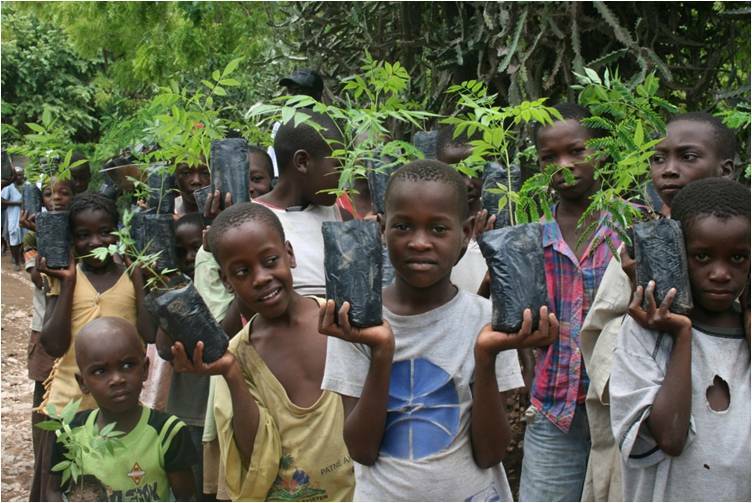 Children help to transplant trees grown by their parents in the Yéle Vert nursery near Gonaives. Like the other five nurseries that make up the Yéle Vert program in the Gonaivesarea, this nursery is run by local farmers. Photo credit: Yéle Haiti / Sebastian Petion. There is good news from Haiti, but it does not make it past the overwhelming bad news that is defining how the country is perceived abroad. For some balance, I would like to share three good news stories from Yéle Haiti. Yéle Vert combines tree planting (close to 400,000 planted so far this year) by farmers with an agricultural service to these same farmers that provides them with seed, fertilizer, tools and training to help improve crop yields. In January the program will be at full capacity and producing one million trees a year. 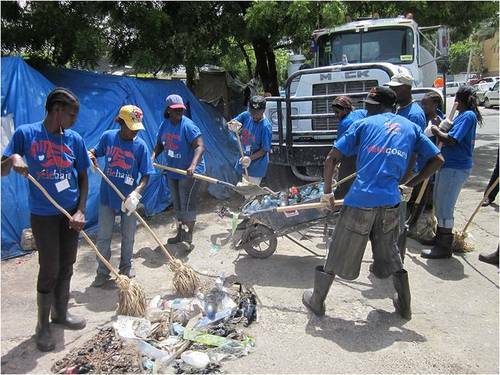 Yéle Corps provides jobs for 2,000 people from tent camps and poor neighborhoods to clean streets and canals, giving both dignity and income to those directly affected by the earthquake. Beginning in January, the program is expanding to include vocational training for 120 people at a time to learn carpentry, masonry and plumbing. Nutrition for Kids employs peasant farmers to grow fresh vegetables that are delivered weekly to 21 orphanages, expanding within the next few weeks to around 40 orphanages and a total of around 2,000 children. Hôpital Albert Schweitzer Haiti in Deschapelles was started by the Mellon family in 1947. Some of my friends think it is absurd to think about the arts in Haiti at this time. As the leadership of the Smithsonian Institute realized the day the earthquake hit, it would be absurd not to. Haiti will recover, and needs the arts for its sense of identity, satisfaction from beauty itself, and for commerce - tourism and gallery sales. The art scenes have been in Pétionville and Jacmel, but I predict that Léogâne will now become the third legs of the arts stool. 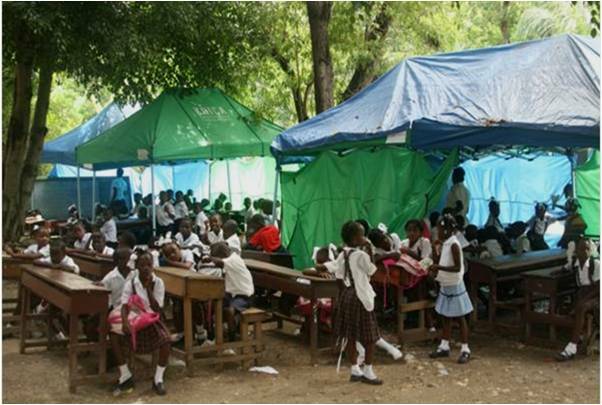 There are certainly countless areas in which Haiti can benefit from support from the international community. In addition to all the very basic survival needs that still confront a significant portion of the Haitian population on a daily basis, I believe a key to long-term success in rebuilding the country is to focus on various forms of education, youth leadership development and the reinforcement of a culture of community service and responsibility. This is not something to be imposed from outside but rather to be modeled hand-in-hand with our Haitian counterparts. Desperate situations can lead people to take desperate and often destructive and lawless actions. Positive role models, on the other hand, can help counter this and to tip the balance from feelings of hopelessness to hope, from fear and frustration to confidence that there is a better future, and from anger and despair to pride that positive change is possible by seeing real examples and actively engaging in the betterment of the community. 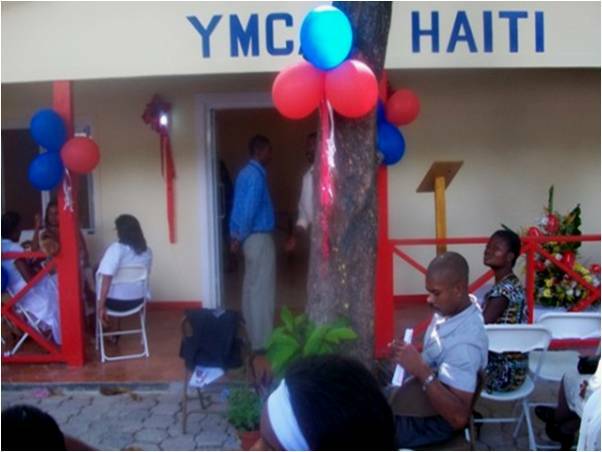 The YMCA of Haiti opened in Port-au-Prince in 2010 and plans for Léogâne in 2011. Young people tend to be at the forefront of major societal changes and for that reason it is especially important for the youth of Haiti to find positive outlets and opportunities, and see positive role models. They are the future leaders and that leadership is being shaped now by what they see around them. They need hope; initiatives such as innovative approaches to formal and informal education and health care, the restoration or reintroduction of cultural outlets, the use of green architecture and agriculture, the inclusion of people from all walks of life in initiatives to improve community life, and the creation of small businesses can provide that hope for a brighter future. As an organization present in over 120 countries, the YMCA has been addressing pressing social challenges and serving local community needs for more than 160 years. The YMCA of Haiti is a wonderful example of a Haitian organization which, with the support of other YMCAs, has continued to provide services to children, youth and families, including services to displaced individuals and those physically impacted. We welcome the opportunity that this creative initiative to build The New Haiti offers for gaining synergy through more integrated efforts of many organizations. This will enable us all to expand the impact in the local community and prepare a path that does offer promise for the future. 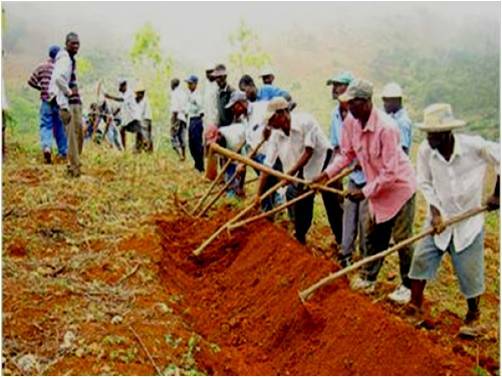 Haiti's "peasant" cooperatives are a source of enormous organization and strength. The untold story of a multitude of small and medium size NGOs which have been involved in Haiti for years is quite a revealing one. Indeed, successes abound namely in the rural areas where thousands and thousands of families have been empowered by the technical and financial supports of NGOs all over the country. 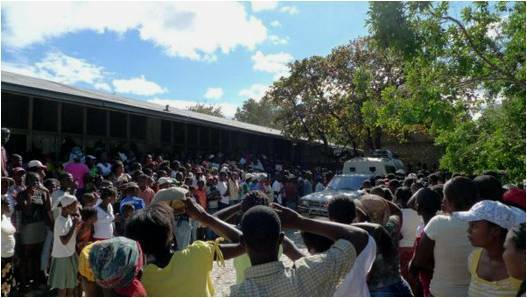 While thousand others joined the effort of the revival of Haiti after the January 12 earthquake, criticism arose about the lack of coordination among them. It is refreshing and promising that some of them have joined forces to exchange ideas and coordinate their actions and therefore avoid duplications and the waste of energy and resources. I salute this initiative wholeheartedly and I hereby promise my full commitment to the New York leadership for helping build The New Haiti. 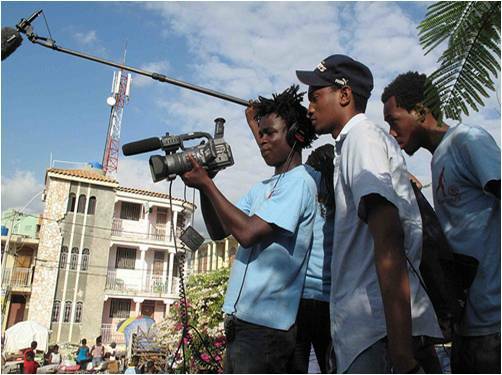 Ciné Institute of Jacmel is a leading cultural institution in Haiti. l'Ecole de la Rédemption in Léogâne carried on post-quake in 17 tents. 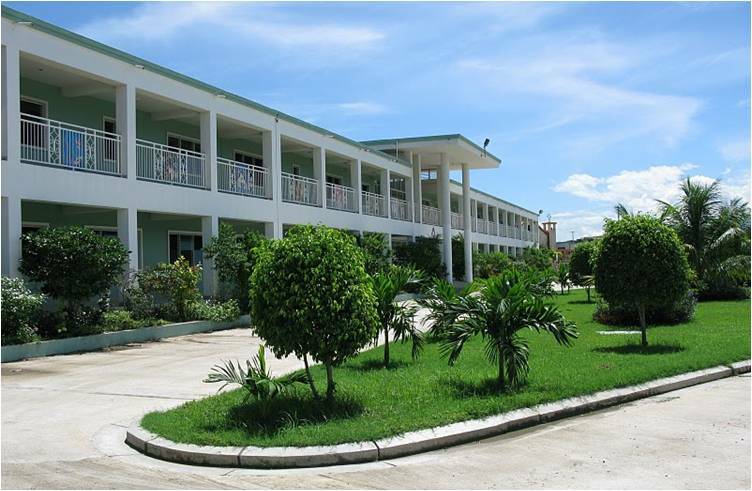 NPH Saint Damien Hospital Haiti in Port-au-Prince is Haiti's leading pediatric hospital. Teach the World Online knows, as does everyone analyzing the situation in Haiti, that education is the key to its future. However, the young people of this country may never receive the knowledge needed to find and create jobs in their homeland by relying on traditional classrooms with traditional teachers. Enough brick-and-mortar schools cannot be built fast enough and qualified local teachers won't be found in this generation to instruct the hundreds of thousands children who today are without schools in Haiti. Only the efficient and cheap use of video conferencing technology between teachers based in other countries to students interacting via a computer over the Internet can deliver immediate and meaningful instruction to Haitian youngsters. Teach The World Online delivers this kind of education combining the tools of the new technology, a multi-media interactive curriculum and a workforce of qualified and willing teachers who are able to instruct students from their homes, offices and schools in the U.S. and around the world. We need others to join us in this revolutionary approach to education in Haiti. There is no other way to go. With our Collaborative Design for Sustainable Housing in Haiti program, we will unveil the six final designs the evening of January 12 at a benefit in the AIA offices on Waverly Place. The AIA is assisting in the creation of housing to be created for $1,000 per home. The models homes are expected to be built for $5,000 each in both Petite Goâve and Léogâne. The Committee needs to raise $30,000 to build the six chosen prototype designs. An additional $30,000 would build the second set in Léogâne. I learned from Father Joseph, founder of Fonkoze, that the 15 years of success of the organization is based on five founding principles: "1) Women constitute the backbone of the economy of Haiti. 2) You can't just give a woman a loan and then send her on her way - you have to accompany her as she struggles her way out of poverty. 3) All Haitians deserve a chance to participate in the development of their country. 4) A political democracy cannot survive without an economic democracy. 5) Nothing in Haiti can be effective without the endorsement and support of the Haitians living in the Diaspora, for it is those Haitians who keep the economy of Haiti afloat through the remittances they send home." For me, the Haitian Diaspora and the Haitian Hometown Associations (HHTAs) are often the forgotten link of the development equation. 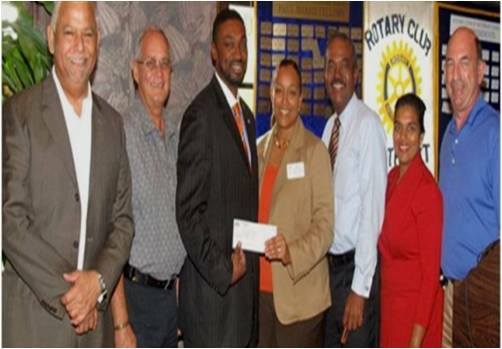 They also have important support and economic development projects in Haiti's rural areas. Fonkoze recognized that link since its founding and has been facilitating transfers for more than ten years at a very low price through its network of 43 branches around the country. Over the last four years Fonkoze, with the support of IDB and IFAD, has opened an active dialogue with the leaders of the Haitian Diaspora. Zafèn is the result of this dialogue, after the video conference on financial training of trainers of April 2009, we followed up with some recommendations made after the simultaneous workshops in Boston, Miami, New York, and Port-au-Prince. One of the recommendations was to have Fonkoze to identify productive projects and business in the regions that Diaspora could invest in. 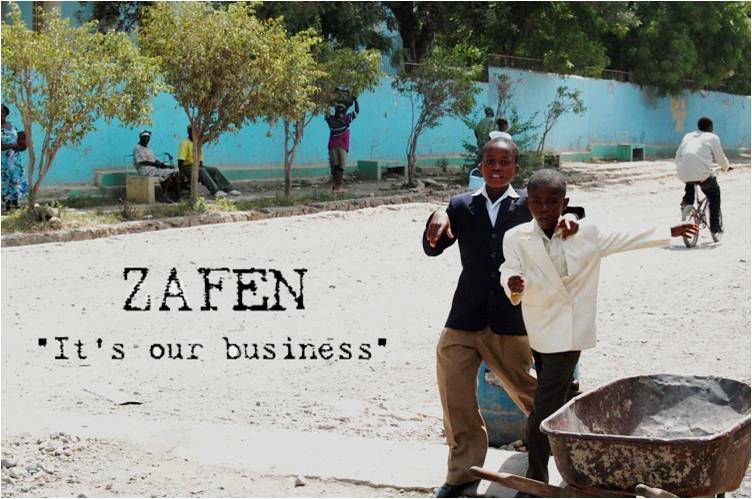 Fonkoze, the Vincentian Family, DePaul University, and the Haitian Hometown Associations Resource Group have developed Zafen to facilitate participation of the Haitian Diaspora and friends of Haiti in sustainable projects and Small and Medium Enterprises in rural Haiti. We have already identified HHTAs doing great work in various parts of the country with grassroots organizations. Since April, we have found more than $200,000 in loans for SMEs and social projects in rural Area. Of course, our focus is not only the Diaspora link. We are looking for small and medium around social enterprises the country that are creditworthy and are potentially sustainable. The idea is to support jobs creation and return to our communities to stimulate economic growth in rural areas. The Haitian Diaspora has been trying with their personal resources to do just that for years. With Zafèn, we are giving them a tool to strengthen their efforts for their region of origin and find financial or non-financial support of friends of Haiti through their journey. U.S. 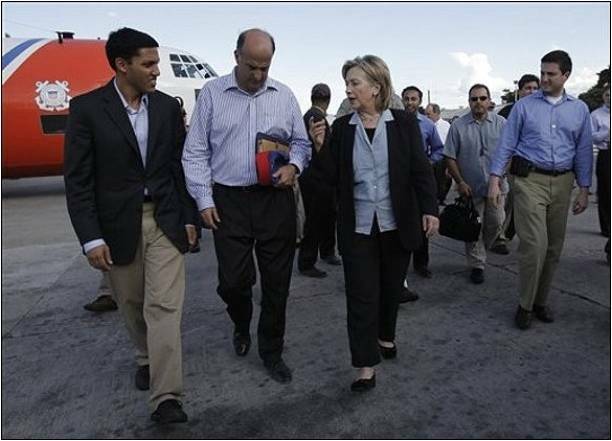 Ambassador to Haiti Merten with Secretary of State Clinton and entourage. As I have seen over the course of twenty-three years of involvement in Haiti, the Haitian people have achieved much in the face of many challenges, including coups, an embargo, and natural disasters. And while the needs remain great, activities from NGO and other private actors, coordinated with the Haitian government and civil society, can complement the efforts of donor nations and multilateral organizations to help the Haitian people realize their dream of a more prosperous future. 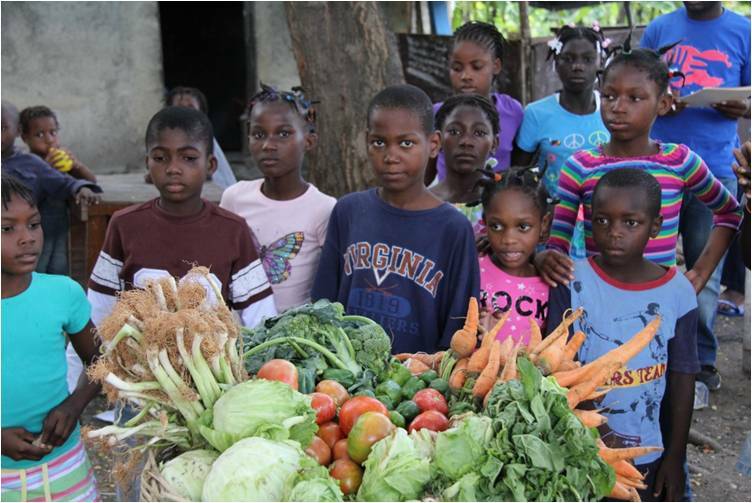 Yéle Haiti provides fresh vegetables every week to approximately 1,000 children in orphanages throughout Port-au-Prince and nearby Kenscoff. The vegetables are grown by peasant farmers who are part of the 6,000-member farming cooperativethat is supported by a grant from Yéle. Photo credit: Yéle Haiti / Sebastian Petion. I am thankful to the thought leaders, global citizens, and organizations helping Haiti such as Wyclef Jean, Anne Hastings of Fonkoze, and former first lady Mirlande Manigat. Given the economy and donor fatigue, every organization needs funding. However, I personally would rather fund an organization where I can see the impact of my gift. As the year-end approaches and we struggle with charitable contributions and holiday gifts, keep in mind that big is not necessarily better. Haiti needs hope -- and so many private initiatives doing so much could do even more -- with your support. There is so much hope for Haiti. Let's fund it.